Details of changes to the funding/availability of nicotine replacement therapy (NRT) from the 1st September 2009. As of the 1st September 2009, some changes have been made to the funding/availability of nicotine replacement therapy (NRT). Newer regulations about NRT prescribing now apply. See “News in brief”, BPJ 34 (February, 2011). NRT will be funded on prescription or Quit Card. Previously, subsidised NRT was only able to be prescribed on Quit Cards. Up to eight weeks of NRT can be prescribed per prescription or Quit Card. This will be dispensed initially as a four week supply with a repeat for an additional four weeks. Previously, only four weeks (in total) was able to be prescribed per Quit Card. If a 12 week course is prescribed, only eight weeks will be funded. The maximum quantities of patches, gum or lozenges that can be dispensed per prescription or Quit Card are listed in Table 1. NRT will now cost $3 per item for a course of up to eight weeks when prescribed on a Quit Card or on a prescription*. For example an eight week course of both patches and gum would cost $6. Previously each item on a Quit Card cost the patient $5 for four weeks supply. The same course would have cost the patient $20. New Quit Cards have been distributed to providers. There is a transition period between 1st September and 30th November 2009 while the old Quit Cards are being phased out. During this time old Quit Cards will be accepted however the co-payment will be different. The patient will pay $3 per item for a four week supply. Prescribers can now prescribe NRT, in addition to other smoking cessation treatments, on prescription. Quit Cards may still be used by prescribers – this is preferable if a patient is likely to incur a higher co-payment due to the prescriber code. Quit Cards will mainly be used by Quitline and Quit Card providers. Up to eight weeks of NRT is available per prescription or Quit Card. Up to eight weeks of NRT will cost patients $3 per item. Patients will initially be dispensed one four week supply, followed by an additional four week supply if returning to the same pharmacy. Patients should be advised to attend an accessible pharmacy because eight weeks stat can not be supplied. A new smoking cessation quick reference card has been produced to incorporate the NRT prescribing changes. 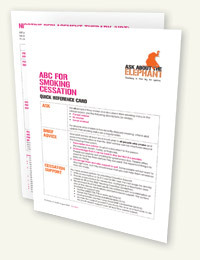 The reference card summarises the “ABC” of smoking cessation. The card also contains prescribing advice about NRT.